Dons boss Keith Millen has urged his players to keep on fighting despite needing snookers and miracles to stay in League 1 this season. 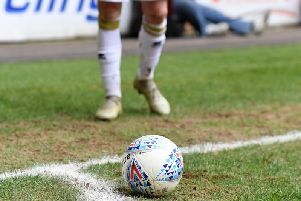 Losing 2-0 to Bradford City on Tuesday night, their fifth defeat in a row, Dons now need to win their last two, hope Northampton win their last two games and hope Oldham, Rochdale and Walsall lose all their remaining games to avoid dropping to the fourth tier. After Saturday's awful 4-0 defeat to Southend and the departure of Dan Micciche as manager, Millen demanded a response from his players and he felt he got it at Bradford, despite the defeat. "I said before the game that Southend was no-where near good enough, irrespective of the rest of our results," he said. "I wanted to see a reaction to the criticism we rightly received. We were clear on what we expected of them, but I wanted them to be brave and try and brave. "First half, we were excellent, we controlled the game, picked up the second balls and we really hurt them. But what let us down was our decision making in the final third and the final ball. We didn't really go for it but took the easy option. "I felt we showed some confidence for a team under pressure and on a bad run. Hopefully the fans saw a response tonight, and that's all we can do. We can't go down with a whimper, I don't want that, I'm demanding that of the group. "What we can dictate now is our effort, commitment and desire to show this club means something to the players. I think we showed that tonight, and I'd have been really disappointed if it didn't. I'm happy to come in on Thursday, look them in the eye and tell them they gave it a go but we weren't quite good enough on the night. "We have to try and take confidence from this tonight and put on a performance and get a result on Saturday in our final home game."